Summer is upon us and it’s time to take this year’s grill to a whole new level! We’re pleased to announce a brand new range of built-in and freestanding barbecues now available to order. With eleven different built-in models and five freestanding barbecues. Whether you grill, fry, bake, smoke or spit-roast, we’ve got you covered. You can do it all without smoke in your eyes, guaranteed. And they’re here in time for summer. Contact us for more information. This entry was posted in Uncategorized on June 19, 2015 by . Not very long ago, heating systems in homes were simple in their design. All that was required was a source of a suitable fuel type and a means of burning it. This is no longer always the case. Since the development of a complex energy market and the increasing volatility of the prices within it, coupled with growing ecological awareness, isolated single solutions are becoming increasingly rare. They have been replaced with combinations of different heating systems that are tailored to the individual life situations, depending on the location and style in which the house is built. The higher the required heating load, the greater the need to control the combustion. With electronic control you get improved efficiency, which means great economic combustion and additional comfort from the time and fuel saved. As more projects aim for Passive House status the control of combustion and air into the property has become key. There is technology on the market that can work with both your stove and the mechanical ventilation and heat recovery system to ensure the correct amount of air is circulating around the property. Technology can, with the right stove, also be used to overcome the problem of frequent weather changes and adverse site conditions. As regulations around the country get tighter, this technology is going to have to play a bigger part to prevent heat recovery systems working over time to compensate for the heat produced by the stove. So whilst the initial outlay is higher the long term savings are attractive. This entry was posted in Uncategorized on March 6, 2015 by . For a stove to work well you require at least 12 Pa (Pascal’s) of pressure to ensure it draws properly. A good installer will check this for you and right this on your installation certificate, and in some cases the manufacturers operation manual. If your flue is not achieving this there are a number of reasons, but the main three can be that the flue is not high enough, or it isn’t insulated, or it is incorrectly designed with too many bends or whatever. To insure that a chimney that is lined also draws properly, is another reason that a good installer will insulate around the liner. When installing a stove doing a hot flue spillage test is also a good idea to ascertain the efficiency of the flue design. If you are designing a flue for a passive house with a positive pressure heat recovery system, then you need a passive flue to minimise the air loss. These are all thing that a good installer can advise you on and will incorporate in the flue design. This entry was posted in Uncategorized on January 21, 2015 by . 1. A pleasure to use. He who chops wood is twice warmed. Wood is a great material to work with and easy to store. Provided you have wood that is sufficiently dry it makes for a great fire and provides great warmth. Rather than using a fossil fuel such as coal, which takes years to form, wood is easily replaced provided for every tree cut down, one is planted. As I have said in previous posts, coal fires require cleaning out every day as opposed to a wood burning stove with which it is a good idea to let a layer of ash build up. This provides a layer of insulation for the base of the stove and also a layer of trapped air to help with the initial combustion. The more air you let a fire use the more heat you loose up the chimney. A wood burning stove has a solid base as it doesn’t need as much air because, provide the wood has a moisture content of 15% or less, then once the initial combustion has occurred the logs will provide the air for secondary combustion. This means that you can control the air going in with a wood burning stove so that the smouldering and lightly flaming logs can provide a surprisingly great amount of heat. When you come in from a stressful day at work, there is nothing more relaxing than the mesmeric, relaxing effect of flames in a controlled box. Who needs Gin? By having my stove on more last year I saved £20 a month off my electricity bill. The wood I put in it cost me a lot less than that every month. The stoor that is created by an open fire is immense, as it burns away; never mind how much is created when you are cleaning it out every day. Since you don’t clean out a wood burning stove everyday, and all the stoves we sell have excellent air wash technology. You get a great clean view of the fire with very little dust. There is really no better way of cleaning the environment of all the Carbon Dioxide that we all put out there than planting new trees. In order to plant new trees people like the forestry commission need to make way for them by felling others. This wood is then sent to make timber for houses, or collected by people with scavengers licenses. So by burning wood on your fire your are helping with Forestry Management and the Ozone layer. This one is somewhat subjective, but it could be viewed by a potential purchaser of your house that the house is more eco-friendly; and therefore worth more. So lighting a fire when you have a viewing could be more effective that having the smell of freshly baked bread wafting round the house. If you have the right equipment you may be able to cook on an open fire, but in most cases roasting chestnuts maybe the extent of what most people do. With a cooking top stove you can make pancakes on it (or drop scones), amongst other things. 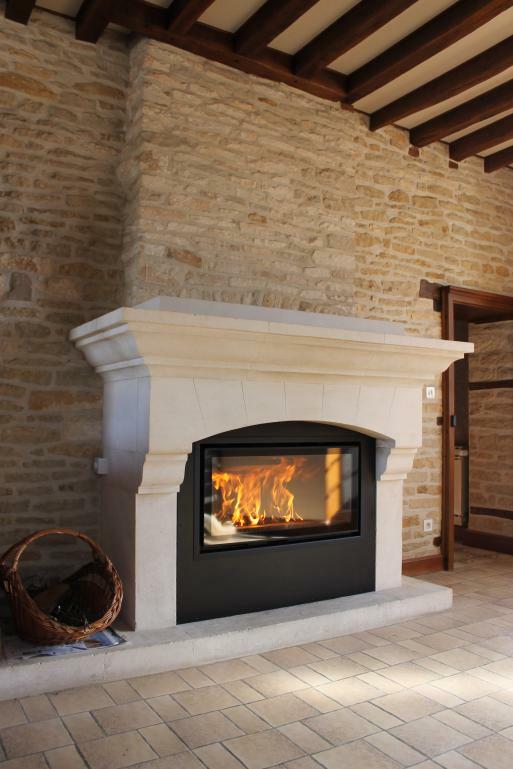 With the right stove you can also connect it up to a system and heat 6-8 radiators. Are wood burning stoves more or less work? People often ask about the cleaning of stoves, but when compared to an open fire all stoves are easier.. Partly because they are closed boxes, there is less shoot and such like, blowing around in the air of the room. So in general the room remains cleaner and more dust free, but also the hearth remains cleaner, and thanks to the air wash system in modern stoves the view of the fire is really good. With multi-fuel stoves when you are burning smokeless coal or peat, then you need to clean it out everyday before you light it. This is so as to let the air feed the fire sufficiently to aid combustion. When you are burning wood in a multi fuel stove this is not the case, as provided the wood is dry enough it will burn the air round about it. In the case of wood burning stoves, a lot of people clean out the ashes way too often. 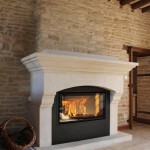 When in fact, it is beneficial to leave a layer of ashes on the bottom of the fireplace. This layer insulates and protects the bottom and the floor underneath from the burning heat of the fire. Also, many people find that it is easier to light the fire if a few pieces of charcoal are left from earlier. Ashes are the non-flammable parts of the wood, mostly minerals. Since ash is an extremely insulating material, you often find small, glowing pieces hidden in the ashes hours or days after the fire is out. When you empty the ashes, it is therefore important that it is emptied in a bucket with a lid, both made of metal. This must be left until you are sure that there are no glowing bits left in the ashes. Ashes cannot be composted, but can be used as fertiliser if it stems from clean, untreated wood. Alternatively, it can be thrown out with other waste. This means that with the air wash system, which both multi-fuel and wood burning stoves have, in general a wood burning stove is less work. A wood stove is never better than the wood that is burned in it. Wood types act a bit differently, some smoulder and turn into big pieces of charcoal, others burn quickly and intensely, but the common factor is that the wood must be as dry as possible. This provides the best heat and easiest lighting, and makes it much easier to burn wood in an environmentally conscious way. When the wood is not sufficiently dry, the heat in the stove is spent evaporating moisture and emissions of matter, and other pollution increases accordingly. The old superstition that the wood should be a little bit “damp” is nonsense. Ideally as little moisture as possible is best. For wood to be called “dry” it should have a moisture content of no more than 20%, but it is easy to get this down to 15%, without kiln drying and the improvement is significant. Wood is carbon neutral and in countries like Norway, constitutes a large part of residential heating. Burning wood today is not about smoky and cracked old stoves, but modern combustion and air technology, high quality wood and sustainability. Modern stoves also provide a magical view of the fire (particularly in the case of the Bionic stove from RAIS). The heat that it is possible to get from a wood stove these days is unprecedented. It provides both deep radiation heating against the skin as well as quick heating of the room. Many of the advantages however, are not apparent until the quality of the wood is just right. So in order to get efficient wood burning, you need to put a little bit of effort into the acquisition and storage of wood. Chopping wood yourself is possible in a lot of places, and gives you free or cheap heating. For some however this is not possible and so for those that buy wood there are some3 things to consider. It is important to buy the wood early. When winter is approaching, it’s like the winter tyres on the first day of snow – it is common sense to be prepared. There is no reason to panic and go to the petrol station or garden centre to buy small bags of wood at ridiculous prices in the blistering cold. By contacting a wood dealer early in the season makes the situation clearer for everyone. Prices are often cheaper then, it is easier to get the wood delivered and the wood dealer can re-stock on their wood. Usually, most wood dealers can deliver dry wood as early as mid-summer. A great solution if you have the means to do it is to buy damp wood early in spring and dry it yourself. This will give you the cheapest price and you will get enough. Get as much as you can practically store. If the space is limited, ask if you can set up a subscription with your wood dealer. When you run out, you either have to get more or turn on the fan heater. Nowadays we are used to having everything readily available at anytime and anyplace, but this can unfortunately be devastating when the forces of nature sets in – because when everyone is cold, everyone wants wood. It can happen that wood dealers in both urban and rural areas have run out during the harshest cold periods. It is easy to become a victim of people taking advantage to make a profit by turning up the price of wood at the same rate as the degrees are falling on the thermometer. Keep in mind that burning wood is positive. If wood burning happens in the correct way, so that the pollution is minimal, wood is a CO2 neutral bio energy. The objective of many governments is to double the use of bio energy and in most cases, wood is the easiest and most practical alternative. So instead of turning on an extra fan heater when the electricity grid is already heavily loaded and the price of electricity is high, it is better to go out to the wood shed and think that perhaps it is too big, but at least it’s not empty. Wood is also a decorative feature and after a mild winter you can keep the surplus for next year. There are many possible ways to store wood, from simple wood stacks to grand sculptures. We will only deal with the things that affect quality, and this involves storing the wood in an airy place and protected against moisture. It needs to be elevated from dirt ground and be protected from rain and snow by a roof. Wood absorbs rainwater quickly and if it remains in damp or wet surroundings, will get mouldy, this might also reduce its combustion properties. The same principle also applies to damp wood that you dry yourself, when it is even more important to place it freely so that it has proper flow of air from all sides. It isn’t rocket science to dry wood properly as long as it is chopped and stacked early in the spring. The low level of moisture in the air will make it dry surprisingly quickly – usually within three months. Sun and heat are two factors, but the element that really dries the wood is mainly the wind. After drying the wood it is a good idea to put the wood in a place that is dry and easily accessible in the winter. If stored badly the problem is not only that the wood gets wet, but also that nature immediately starts its decomposition process. Birch is especially vulnerable to mould and fungi and regardless of wood type organisms large and small, like wood lice and worms, will with time make their dwelling in the wood and all the enjoyment will be gone. This is easily avoided as If space allows it, a separate wood shed with great ventilation is the best thing. In many residences, the most realistic alternative is to store wood in a place that is less used during winter, for example a play house or veranda. Tarpaulins can make do as coverage for a while, but never wrap the wood so well that it can’t breathe, even if it is dry. It is however better to place the wood under a projecting roof or to make a simple slanting roof out from a wall. The roof can also be hinged so that it is easier to fill the storage space and it can also be removed during summer. The easiest way to store short wood (less than 30 cm) is in a bag, but one trick to stack loose, short wood against a wall, is to include a few longer pieces of plank at a 90 degree angle from the wall so that they stand straight out. When the wood is placed tightly against these, the stack will lock itself so that it doesn’t fall out or over. If a free-standing, temporary wood shed is a possibility, you can make it quickly and easily from pallets and corrugated iron sheets. . The pallets are used as floor and walls and planks attached diagonally on the back lend the construction rigidity. Six large pallets make room for two cubic metres of wood (approx 70 cubic feet) and since they are the same colour as the wood, they don’t look too bad either. There are many variations that can be built according to need or aesthetic; most variants will do, as long as the roof is hard and tight and the construction solid enough to withstand wind and snow. A long projection helps to keep out driving rain and snow. The view of a stack of wood is a view of something safe, and when you have the snug and cosy feeling of wood burning under your skin, you can look forward to winter. This is because you know you have things in order, that you are in sync with the seasons, and that you have enough wood and that it is good wood. A little bit of planning gives you a great feeling of control -which you can handle and live with the seasons. Then it’s no problem that the cold weather tries to make trouble outside, while the oldest source of heating known to man is crackling calmly in your fireplace. This entry was posted in Uncategorized on June 25, 2014 by . We are so used to increases in the price of oil and gas due to fluctuations in the demand and concerns about reserves, that wondering if the price of wood as a fuel is likely to increase; is a fair question. Indeed the Scottish Timber Industry has warned that it could face a serious decline if the problem of more trees being felled than is planted is not addressed (http://www.bbc.co.uk/news/uk-scotland-11794511). As the report pointed out however this is likely to take a few decades to become a noticeable problem. This then gives the likes of the Forestry Commission, and politicians, plenty of time to act to ensure the situation is reversed. Some companies like Egger, are involved in helping companies create and manage forestry. This in turn helps larger companies with their corporate social responsibility. All this means that it is wood fuel is unlikely to mirror the volatility of mineral resources. After all one of the beauties of using wood in construction, door manufacturing and as a fuel for heating is that provide the forestry is managed in a sustainable way, it is a relatively easily replaced resource. There is always a way of doing something slightly cheaper, whether it be doing it yourself, or buying a cheaper product. However when price is the only consideration, buying in haste leaves time to regret at leisure. The quality of the workmanship is really the key thing to consider when making a worthwhile purchase. If you want something to last and provide you with value for money, then it is important to take a long term view. There are plenty of programmes on the telly, telling of building disasters and problems due to the poor delivery of the service and product offered. Whether it is a new stove, a new boiler system, a new kitchen, new doors, or windows the quality of the delivery in terms of workmanship is as important as the quality of the chosen product. A satisfied customer is one that will come back and be an advocate for a business. After all word of mouth is the best form of advertisement a company can have. Since we all want to be satisfied with our purchase decisions, it is worth going with a company whose delivery you can rely on. This entry was posted in Uncategorized on May 9, 2014 by . A clean conscience that is environmentally profitable. As discussed in previous posts there is no reason why by doing your part and burning wood on the stove you relax in front of; you should not have a clean conscience. A lot of the stoves that we at the Scottish stove Centre sell lead the way in terms of environmentally conscious technology due to their clean burn. This means that when the wood is burned, gases and particles are released, which instead of being sent up the chimney as they would be in an open fire in the form of smoke and soot. They are burned by adding extra heated air just above the fire. This gets a great deal more from the wood, up to 90% more with some stoves, when they are burning at their optimal performance. Such developments in burning technology have reduced the amount of fuel required to produce the desired amount of heat, when compared to earlier non-clean burning fireplaces. This means that provided you burn your stove in the correct way you can use about half of the wood you would have burnt on an open fire, or older stove. This naturally saves you money. Some stoves such as Jotul are produced from recycled materials such as iron and steel that are melted down before being reused. Thereby saving the worlds’ resources. When coupled with the fact that wood is a replaceable fuel, and when new trees are planted they help clean the air. By burning wood you are making way for new trees to be planted, saving money and the earths resources. This entry was posted in Uncategorized on April 16, 2014 by .